Why the different look? Because I've got a guest poem at Lyrics and Maladies, that's why. And today, I'm swinging with Bootsy and Macy, as we light up the Eiffel Tower with--what else?--an accordion song. But first, let me acknowledge something--I feel a little guilty. See, Joaquin Carvel posts a new poem every Thursday. And he has a very devoted following of readers, including myself, who looks forward to Thursdays for this reason. This is not hyperbole. It's just the way things are. Joaquin is a poet of such considerable talent, of such rare, intuitive lyricism, that I've often thought it unfair that so few people have the chance to read his work. So if any good can come from my usurping his place for a week, I hope it's to lead some of you to his blog for the very first time. Stay awhile, and scroll down the page. You will not regret it. Of that I am certain (and I'm never certain). Okay. 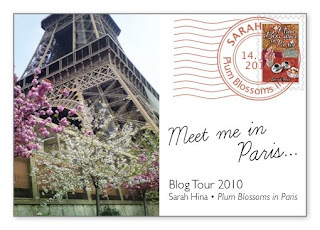 Again, if anyone else would like to interview me, let me guest post on your blog, review the book, or play with my postcard, send me an email at Sarah.Hina AT gmail.com. Thanks. I've been sick lately. How sick? Just your common head cold, with all the banal misery that entails. But throw in the stickiness of summer, and it feels, well, a good bit sickier. Well, no use in spilling all them beans. I've also got a review up today over at Stephen Parrish's. And a very nice review it is. In fact, I'm so pleased with it, I'm thinking about having it tattooed on my forehead. Or at the very least, this pull quote, "The prose is stylish, sensitive, and refined, the result of a natural born poet tackling a larger canvas. Plum Blossoms demands a second reading merely for the beauty of its language. The promise of the author's next novel, and writing career, is high." Thanks, Steve. And Mark. I'm deeply grateful to both of you. And that's not just the Nyquil talking. Remember, if you want to review the book like Steve, have me guest post like Mark, or interview me, then shoot me an email at Sarah.Hina AT gmail.com. I look forward to it. Today I'm guest-posting at Jaye Wells' place about what blogging means to me. Included in the post is the very first vignette I wrote for Murmurs. And reading it again, together with the comments it received, put a little lump in my throat. See, posting at Jaye's is a little like a blogging high-school reunion for me. Although, if it were truly that, I'd have to go back to her original home, Jaye's Blahg. But there is good reason for Jaye to have new and fancier digs. She has become the most successful of my writer friends, with her newest release, The Mage in Black--the second book in her crackling, Sabina Kane vampire series--hitting shelves this past April to great reviews and (from my nosy monitoring of her Amazon rank) great sales, too. And I can say this--nobody deserves success more. Jaye's wit, intelligence, and work ethic have always left me feeling a bit like a high school freshman who stares with awe at the senior who has it all together. She alone has made my Twitter membership worth it. And I'm very honored to stand beside her today. Thanks, Jaye. You, too, can make me cry! Yes, you! 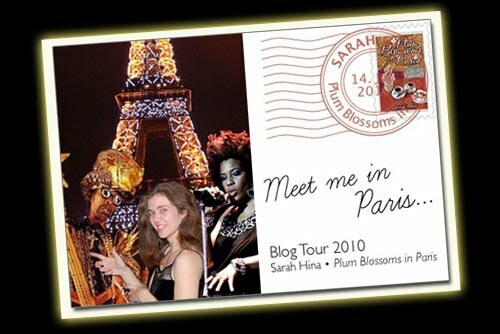 Just shoot me an email at Sarah.Hina AT gmail.com, if you'd like to interview me, offer a guest post slot on your blog, or review the book. I promise to have tissues ready. Sniff. She reads! She reads! Plum Blossoms excerpt read aloud. 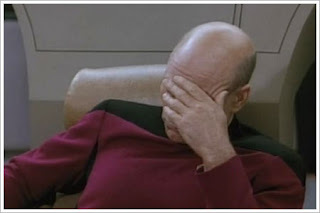 I'm pretty sure author-dom is turning me into an incurable liar. 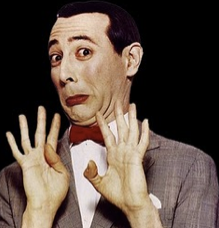 In addition to all the raging narcissism, I give myself three months before the first nervous breakdown. Exxxcellent. But seriously, check out the interview. Aerin is one of those friends who will step up for you time and time again, and in truly unforgettable fashion. I first met her through a Clarity of Night contest, where her entries consistently ranked among my favorites (no pressure or anything this time around, Aerin). Intelligent, yet always deeply felt, her work is instantly recognizable to me and always touches the right nerve. I'd also highly recommend ordering a copy of get born magazine's current Summer issue, where Aerin writes in stark and moving terms about her son's autism. So come on by! And just so you know, my blog-tour dance card is still open! So if, like Aerin, you'd like to interview me, review the book, or offer me a guest post slot on your blog, get your back off that wall, and give this a whirl. I promise--I won't even step on your toes. Much. She can read! She can read! Plum Blossoms excerpt read aloud. I will be choosing the winners of Aniket's Plum Blossoms flash fiction contest on Friday, July 23rd! I was very pleased with the number of entries and the quality of the work. So stay tuned for the big announcement!! ....and I'll weep if I want to. Thanks, guys. You are both amazing writers, but your talents for friendship--and the size of your hearts--are what impresses most. Certainly not your taste in men. If anyone wants to offer me a guest post slot on my blog tour, interview me, or review the book, shoot me an email at Sarah.Hina AT gmail.com. People aren't sick enough of me yet. With your help, we'll get 'em there. Today I'm answering Richard Levangie's "25 Questions" over at Telling Stories. Other authors have gone before me; I wonder if any of them feared Oprah's couch quite as much as I. Luckily for me, this interview was a pleasure to take part in. And some of that has to do with the man asking the questions. I haven't known Richard for very long, but I'm glad I know him now. He's a sharp journalist and wonderful writer working hard to complete his first novel, a thoughtful environmental activist, a doting husband to his wife, Kristina (who designed the gorgeous postcard above), and a warm and generous friend. Plus, he's Canadian. His contributions to Travis Erwin's "My Town Monday" series have me itching to visit his beloved Nova Scotia so badly, I can almost taste the salt in the air. And if anyone else wants to interview me, offer me a guest post slot, or review the book, shoot me an email at Sarah.Hina AT gmail.com. Thanks. 5 more days until Aniket Thakkar's Flash Fiction contest ends! Win a copy of my book before it's too late!! Beep, beep. *what? one is true. sort of. 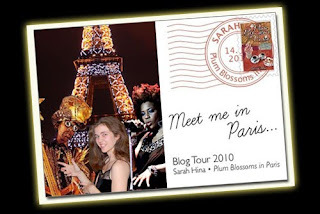 Today, I'm kicking off my blog tour, in support of Plum Blossoms in Paris, with a guest post at Travis Erwin's place. It's titled "Anatomy of a Writer," and describes my fledgling genesis as a writer, back when I was in med school. And some icky stuff about gross anatomy. But mostly--the writing thing. If anyone out there is willing to interview me, review the book, or offer a guest post slot like Travis so graciously has, so that my book becomes an instant bestseller and I can finally become as insufferable as this guy, please send me an email at Sarah.Hina AT gmail.com. And if you'd like to interview me in Paris, why, just send a plane ticket instead. Seven more days to enter the Plum Blossoms in Paris flash fiction contest over at Aniket's place!! Beep, beep. Night spreads its palm across the plains. Crickets lose their count, and start again. An owl opens its eyes with dread aim. Darkness is a figure eight. The girl lies on the blanket, clutching a book to her chest. The big toenail on her right foot digs at a mosquito bite. Her smile curves with the horizon, and her eyes clock shooting stars. Clouds blow wide, netting wayward constellations. Wind is a careless laugh. She doesn’t know. She doesn’t know, lying here, that this ground is sacred. That she will return to the place, in dreams and recollections, and run her finger around the cool, sharp lip of time. That she will reflect back on the strawberry skirt she wore, and slip that finger inside its hidden pocket—before it dissolves. That she will, one day—and sooner than seems right—pair bitter to the sweet now cradling her. That she will shape the clay of now. The moon is a pockmarked teenager. Bats are birds with the song squeezed out. Looking up at a moon. Her breath catches on the crescent thought. She sets the book down in the grass, and extends her arms above her head. Growing herself a little taller. Feeling the warm flutter beneath the ghosts of breasts to come. Making room. Over the hills, fireworks begin. She hitches up her elbows to watch their frantic pop and stomp. And soon misses her quiet canvas. Fear is a horse with too many hooves. She scrambles to her feet, and runs across the field. Her legs through the rushes are the pulse of someone else’s youth. Her small fists punch the night. Her braids flap in figure eights. The book’s cover, on the grass behind her, glows blue, then red, before falling to black. The owl spreads its wings and takes to air. 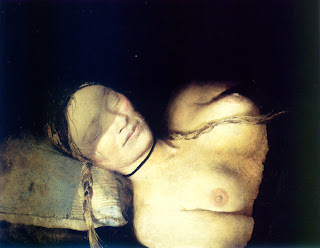 The art is Andrew Wyeth's Night Shadow.